Material preparation with flakers or chippers requires high inputs of energy if chips of consistent quality are to be manufactured. This constancy of chip quality has a direct effect on subsequent board properties, making it of crucial importance for the production of wooden boards. 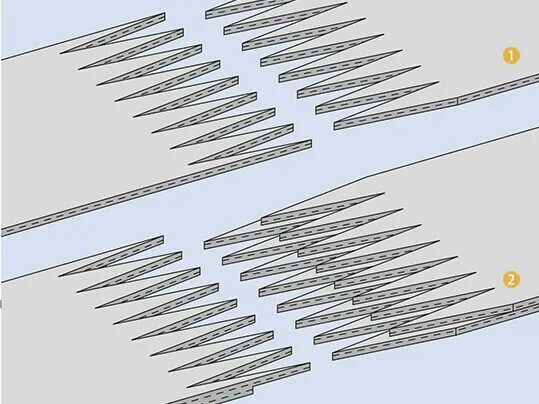 As a constantly varying load affects the tool shaft during wood milling, the drive system should be designed such that shocks and impacts can be compensated for. 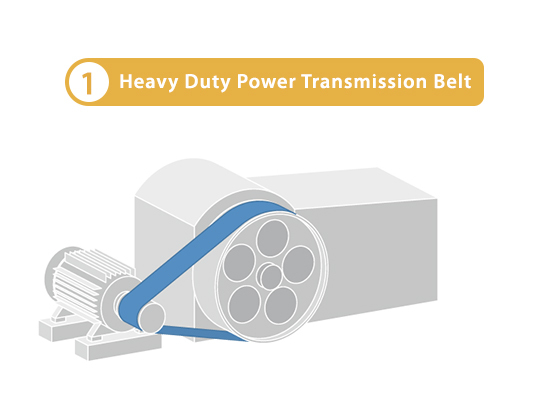 In these applications, therefore, highly efficient heavy-duty power transmission belts are a better alternative than sensitive mechanical transmission designs with considerable energy losses. With its Extremultus drive belts of the P and endless lines, Forbo Movement Systems provides a particularly effective solution for the transmission of large amounts of energy with a high degree of efficiency. While, in the P series, high damping properties have an additional positive effect, the splice-free endless line operates especially quietly and allows low elongation at fitting. With Siegling Extremultus heavy-duty drive belts, chippers, flakers can be driven reliably and efficiently, with especially small reversing-drum diameters. Our customers value these belts’ long service life, low maintenance requirements and quiet, vibration-free operation that is easy on bearings. For simple, rapid, efficient installation and other service activities, specialists and equipment are available to our customers under the global FS service network. the type of splice. Other important aspects are where the splice is to be produced (workshop or on-site assembly) and the relevant belt width. 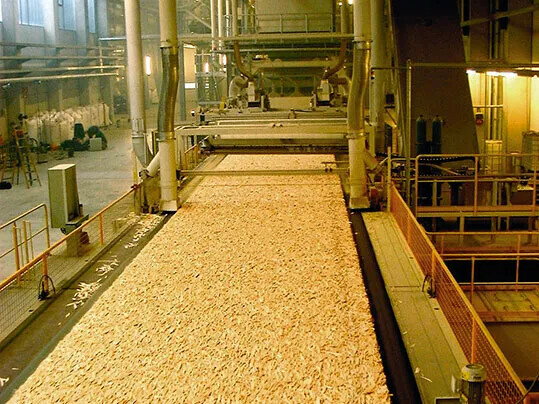 Bin bottom belts are used at various process stages in the manufacture of wood based panels: in large wet-fiber bins and chip silos upstream from the dryer, as well as in connection with buffering of dried chips, in dosing bins used in connection with gluing, and as a vital part of the forming line in spreader bins. 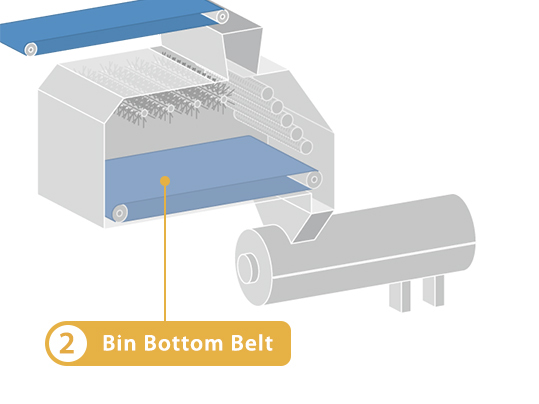 Bin bottom-belts need to have high lateral stiffness and thickness accuracy. 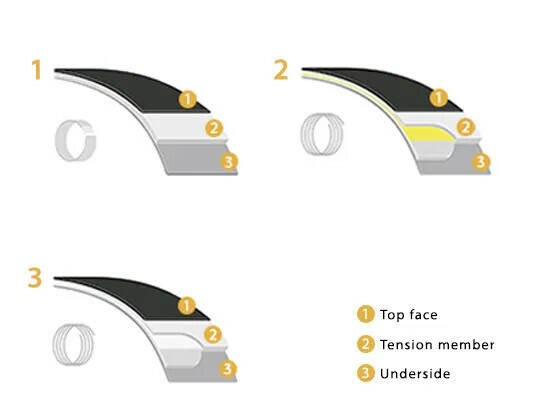 To prevent adhesion to the belt, the surface requires good release properties. When used in wet-fibre bins and chip silos, high surface loads and (in outdoor situations) weather conditions must also be taken into account. Additional functions require other specific belt properties. 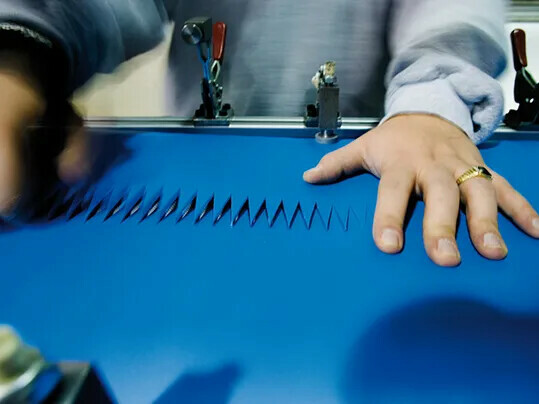 Where belts are used for check-weighers, utilized in connection with gluing, strict compliance with thickness and weight tolerances is crucial. When conveying dry chips/fibers, belts can be fitted with longitudinal profiles for lateral-sealing purposes. From a large portfolio of bin bottom belts, Forbo Movement provides the right belt for a given use. 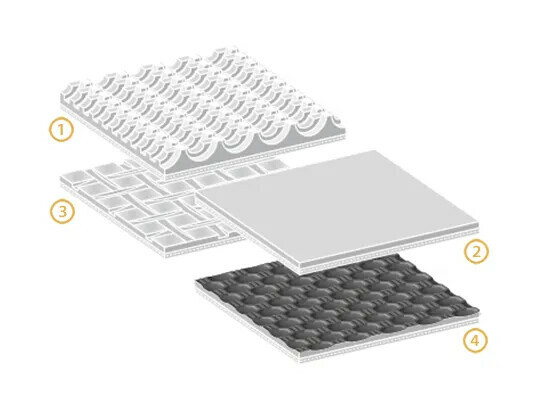 Tailored to a given conveyor, PVC, polyurethane or silicone surfaces with different structures and tension member design can be supplied that optimally enhance the process. Depending on the installation situation, both melt splices and mechanical fasteners are available as the splicing technology. 1 - Z-splice: Meets the most rigorous of requirements for uniformity of thickness. Very flexible splice, required particularly for knife edge belts. Standard splice for 1 and 2-ply belt-types. 2 - Stepped Z-splice: Vergleichbare Properties comparable to those of the Z-splice. Also suitable for rugged operating conditions (e.g. soiled drums). Possible for various 2 and 3-ply belt types. 5 - Plastic fasteners (KS), also available optionally imbedded or heated into the belt coating. Which equipment is ideal in a given situation depends mainly on the type of splice. Other important aspects are where the splice is to be produced (workshop or on-site assembly) and the relevant belt width. Forming or spreader belts are a major factor affecting the quality of composite wooden boards to be manufactured. 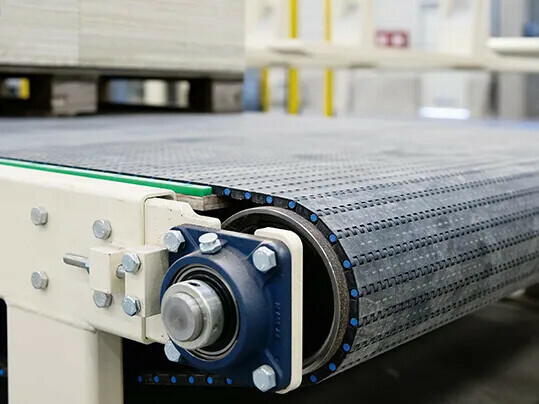 On the forming belt, the fibers or chips supplied by the forming machines are shaped into a mat of (as close as possible to) the precise thickness and weight required, and are fed into the pressing process. 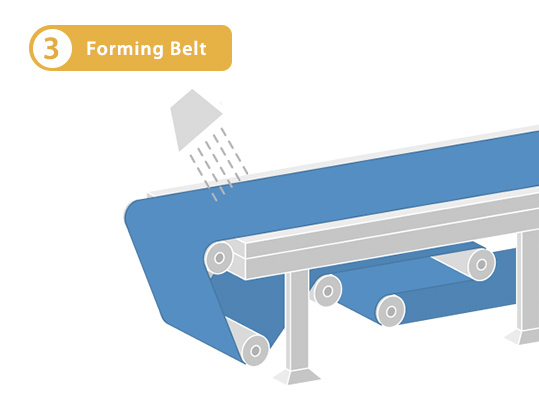 Modern forming belts are far more than merely conveyor belts. As components that influence quality, they need to ensure low tolerances with regard to thickness and weight (this includes the splice area). Despite the many chemical components in wood material, in glue and in sprayed release agents, chemical resistance must be ensured. Even after a lengthy operating period, there must be no chips adhering to the surface. In order that nosebars can be used, high lateral stiffness and flexible splices are required. Forbo Movement Systems has two alternatives as robust 1- or 2-ply belt types with polyurethane coating available for use as forming belts. They can be joined using a Z splice or stepped Z-splice that allow nosebar radii down to a minimum of 8 mm. And, of course, the belts have antistatic properties and are suitable for passage through metal detectors. Thanks to the use of single-ply high-tech fabric, this type has become a top seller in the industry. The specific features of this product are extreme precision, high lateral stiffness and low minimum drum diameter, combined with a maximum width of over 4000 mm. Its special design also makes this belt type virtually maintenance-free – re-tensioning due to belt elongation is not necessary. This 2-ply belt type was specially developed for highly adhesive conveyors, and its distinctive features include excellent chemical resistance, hydrolysis resistance and ideal release properties. Use of this belt type can lead to considerably longer service life in problematic systems. Efficient ventilation of the spread fiber mat or chip mat is a major factor affecting the quality of wood based panels to be manufactured. It prevents air pockets forming in the board that could lead to quality issues. 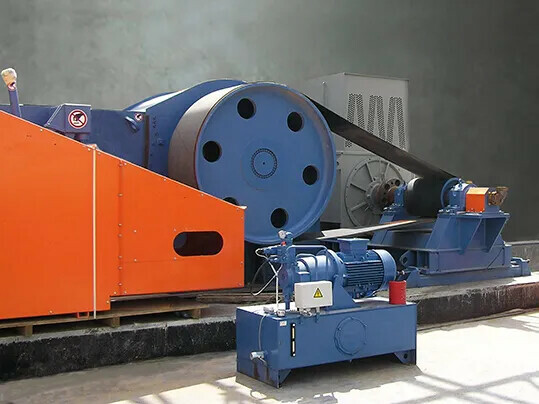 Pre-compression of fiber mats or chip mats must be effective and such that sufficient air escapes from the belts over a relatively short distance without lateral expulsion of the wood material occurring. 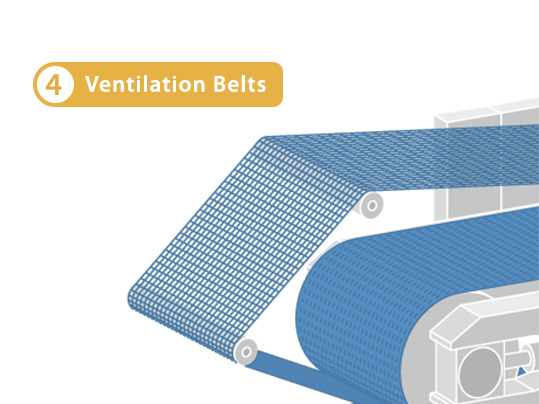 Ventilation belts are always fabric belts, i.e. they have a permeable structure. The mesh size used needs to be tailored to the wooden material in a given case so as to achieve an ideal compromise between ventilation performance and chip geometry. Copper or carbon threads woven in the polyester yarn make the belt highly conductive and prevent electrostatic build-up. There is no risk of critical fire safety situations. Forbo Movement Systems provides a range of enhanced belt types from the Transvent Series for use as ventilation belts. All belts have a highly conductive finish preventing adhesion of chips and fibres. Due to their stable fabric structure with sealed edges, they achieve two primary functions simultaneously and uniformly: namely, ventilation and pre-compression. The Transvent Series with its three types – W01, W02 and W03 – are products with air permeability of up to 9900 m³/m² per hour. Marking-free Z splices or endless woven belts, as well as corresponding mechanical splices, make for various splicing options. This allows rapid and reliable assembly tailored to a given pre-press. For simple, rapid, efficient installation and other service activities, specialists and equipment are available to our customers under the global Forbo Movement Systems service network. 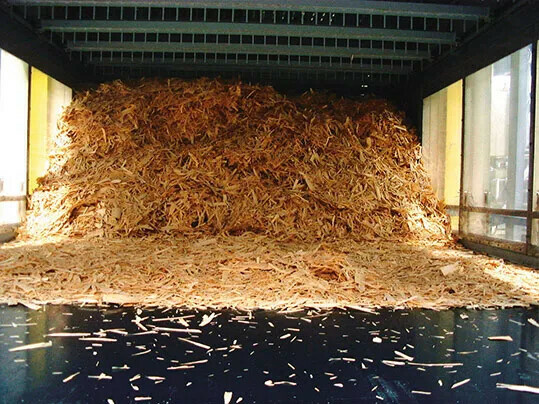 Modern plants for wood-based products are equipped with continuous pre-presses that pre-compress and ventilate the spread fiber mats or chip mats before these mats are conveyed to the main press. During pre-compression between several successive pairs of rollers, much of the air contained in the fiber mat is expelled. 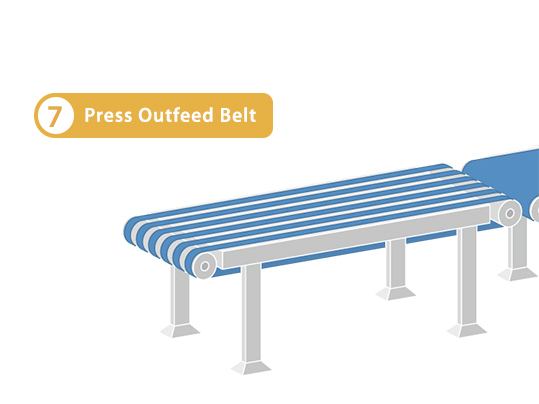 To prevent the fiber mat being subject to a spring-back effect, a pre-press belt conveys it through the pre-press while also holding the mat together in a compressed state. 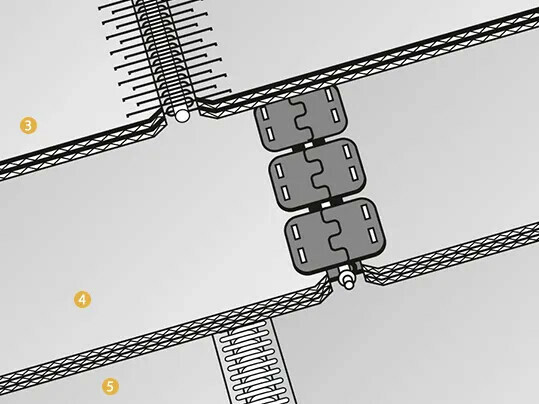 So that the fiber mat can be compressed and held together, pre-press belts must be extremely strong; they therefore require a highly modular tension-member structure. To ensure the surface of the pre-compressed boards is of high quality, low-wear belt coatings with good release properties are required. Other fundamentally important characteristics are marking-free, reliable and durable splicing technology, as well as being able to use a perforated upper pre-press belt to aid mat ventilation. 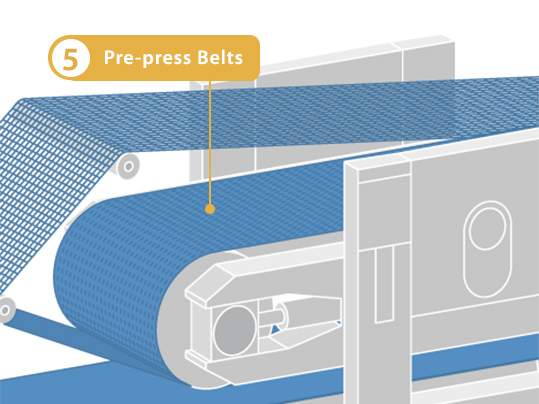 Forbo Movement Systems has developed an enhanced, 3-ply, polyurethane-coated belt for use as a pre-press belt, with a tension member made of aramide fabric. The highly modular aramide fabric gives rise to excellent elongation properties, and compensates for high nip pressures and belt pull. A distinctive aspect of this belt is its versatility of use, including that in heavy pre-presses with nip pressures of up to 3000 N/cm and belt pull of up to 1800 N/cm. pre-pressed boards is of excellent quality, with the fabric’s structure inside the belt ensuring compensation for lateral forces (caused, for example, by belt tracking). In this way, pressure peaks and differences in thickness within the chip mat can be adjusted. 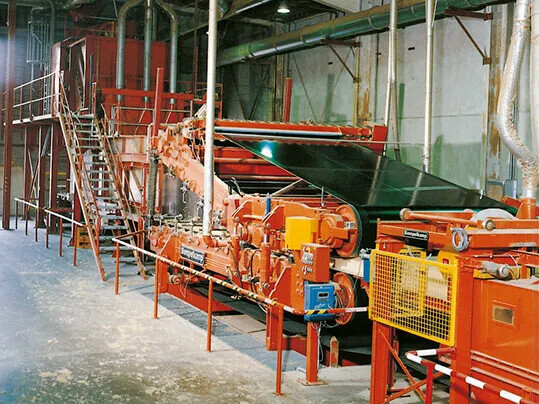 Modern plants for wood based products can be equipped with pre-heating units to increase their effectiveness. These are available as steam pre-heaters or microwave units, and heat the pre-pressed chip mat or fiber mat before it enters the continuous press. This upstream heating of the mat means the continuous press can run faster. The method in which Forbo Movement Systems has specialized is that of microwave pre-heating. 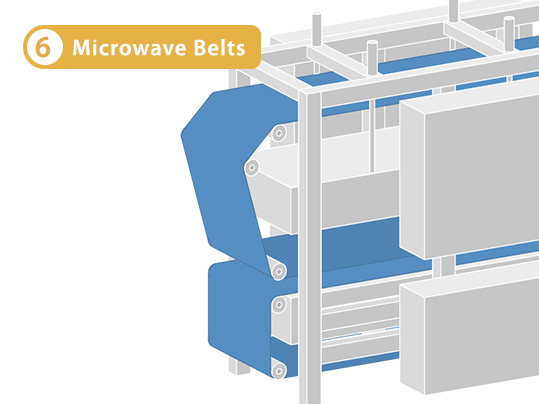 Microwave units are equipped with an upper and a lower belt. As with all other belts on the forming line, high lateral stiffness, excellent antistatic properties and marking-free splicing technology are of fundamental importance. Because the molecules of the chip mat are set in motion by a shortwave alternating electrical field as they pass through the microwave unit, one particular focus regarding the belt materials used is on their heating performance. Forbo Movement Systems has tested a wide range of materials for use as microwave belts and enhanced their composition. Many standard types – with polyurethane coating, for example – have proven unsuitable for this application. One perfect solution for this use, however, is our belt type E 8/2 X0/A2 MT-NA-HACCP white FDA (article no. 906776). It is not only its coating that makes it suitable for specialist use as a microwave belt. With its belt thickness of 1.7 mm, it also has outstanding lateral stiffness even after being slightly heated, without the belt edges dishing. Forbo Movement Systems is the only supplier worldwide that is able to provide microwave belts of up to 3350 mm in width without a longitudinal seam. As it exits the continuous press, the continuous ribbon of board is transferred to press discharge belts that feed it to the crosscut saw. Press discharge belts usually run as a group of belts (several narrow belts arranged parallel to each other). The chief requirement for these belts, which move only horizontally, is reliable, skid-free conveyance of the boards to ensure their exact positioning. 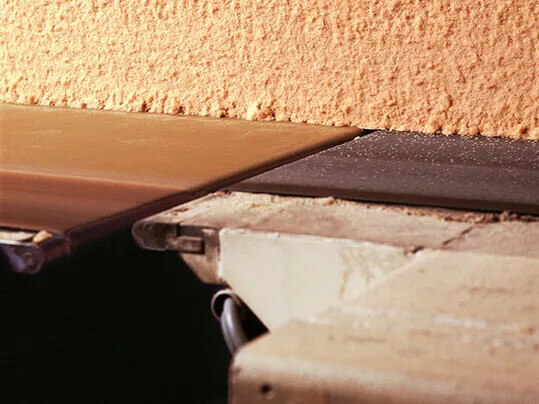 Good heat stability is required because of the close proximity to the continuous press and the fact that the temperature of the boards is still very high at this point. Forbo Movement Systems has a wide range of belts for which perfect grip and exact board positioning are provided by suitable tension members, coating materials and top-face patterns. From this portfolio, any conveyor can be optimally fitted for a given set of board properties. 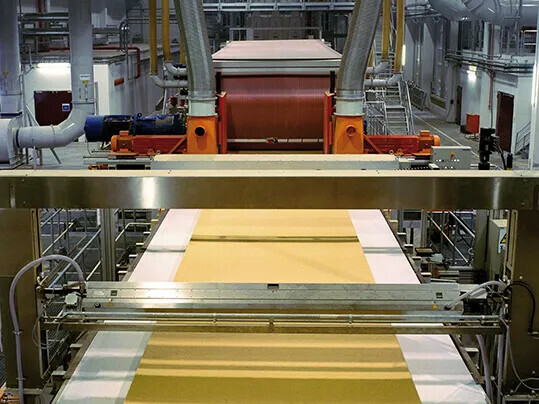 In plants making wooden panels, it is generally robust conveyor belts or heavy live roller conveyors that are used for moving boards and board stacks. Use is often also made of plastic modular belts for conveying pallets. Of particular importance in the (chiefly horizontal) conveyance of boards and board stacks are reliable, skid-free conveyance and exact positioning of the stack. 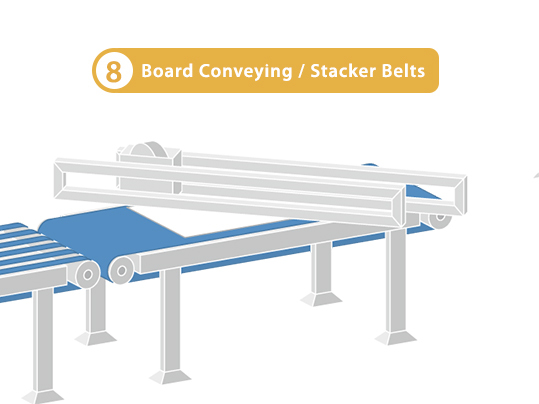 Conveyor belts also need to be extremely robust, as the board stacks are transferred to heavy industrial trucks. 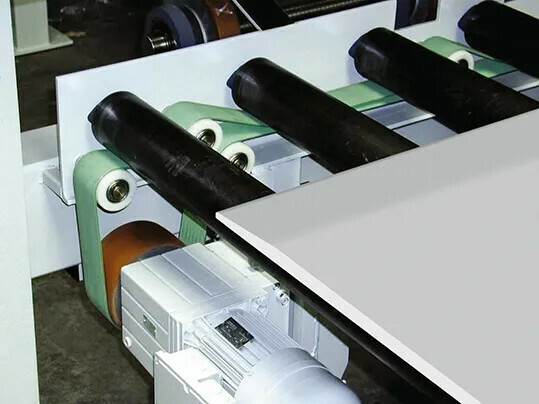 Siegling Transilon - conveyor belts generally arranged parallel to each other in a group, these are used for transverse conveyance of boards, in board turners, and for in-feed and out-feed areas for dividing saws and wood sanding machines. flexing action. For heavy live roller conveyors, the particularly robust and hard-wearing belts from the Siegling Transtex line are recommended. Where plastic modular belts are used, our Prolink system enables customized solutions to be configured. As well as straight-ahead and curved conveyance of stacks, entire ‘marshalling yards’ can be created. The Prolink Series S7, S8 and S9 have been developed specifically for conveying very heavy loads such as board stacks and pallets. 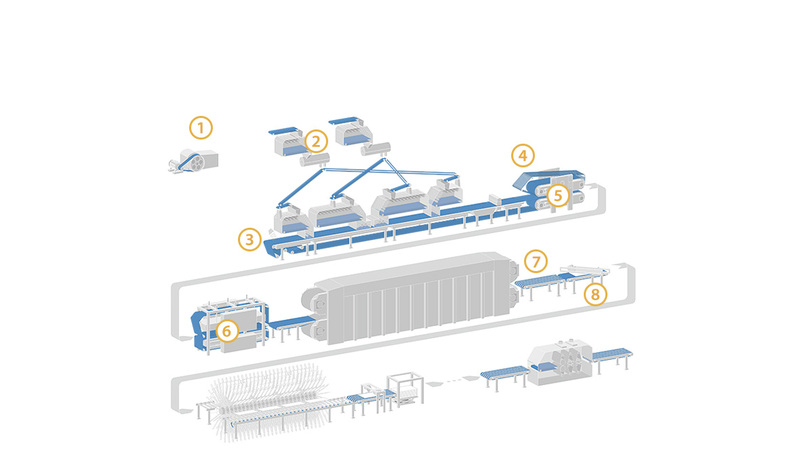 Siegling Transilon conveyor belts and processing belts allow efficient material flow and cost-effective work processes. In all conveyance functions, the reliable, skid-free conveying of boards ensures exact positioning and prevents production waste. To this end, particularly robust belt types with two or three fabric layers and anti-skid surface coating are used. Extremultus belts for power transmission to line roller conveyors are energy-saving, durable drive elements that feature constant grip and high tensile strength. Their structure allows rapid assembly and results in low-maintenance requirements. 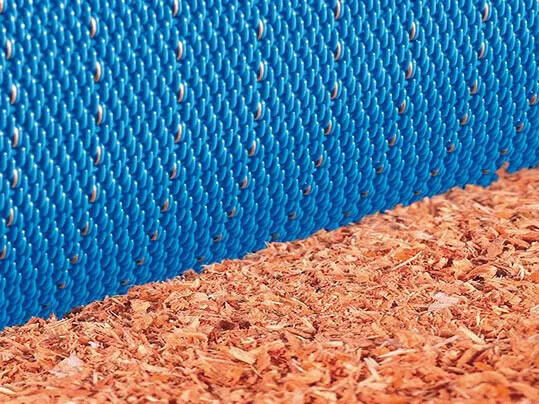 In particular, E-type Extremultus belts (with polyester tension members) are used in the wood products industry because their properties are independent of ambient conditions, with tension kept consistent. Transtex belts have ideal features for coarse applications, such as power transmission of heavy live roller conveyors. Thanks to their robust nature and puncture resistance, as well as their high abrasion resistance – combined with benefits such as low energy consumption, low vibration and long lifespan –these belt types are perfect for heavy-duty uses. As well as especially high dimensional stability, they are flexible, low-noise and are resistant to moisture and chemical effects. Siegling Prolink plastic modular belts are robust, durable, and allow efficient conveyance and processing functions. Individual modules can be rapidly replaced in the event of damage. This reduces downtime and maintenance costs. The Prolink Series S7, S8 and S9 include especially strong and robust belt types with excellent tensile strength for industrial applications, and are designed for conveying heavy loads.